Adding links in WordPress articles can direct your readers to useful information from your other posts and from external sites. Articles with links score higher when indexed by search engines, which means that more readers are likely to find your content. 1.When you get to the point in your writing where you want to insert a link, click the Insert/Edit Link icon in the WordPress toolbar. 2.The link has two parts: the URL, which is the web address of the location you want to go to, and the Link Text, which is what the readers will see and click on to follow the link. The link text will be blue and underlined, like this. The link text can be a single word or a phrase. Click the check box under the link text if you want to make the link open in a new tab instead of navigating to the link in the current tab. 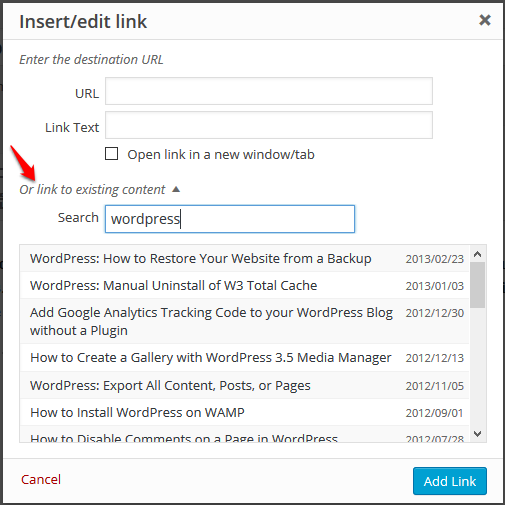 3.If you are creating Internal links in WordPress, you can save time by using the built-in link to existing content tool that can be found by expanding the section at the bottom of the insert/edit tool. WordPress lists your most recently published content and has a box you can use to search for the content to which you want to link. This saves you from having to open another tab, find your content, and copy-paste it into the URL box. 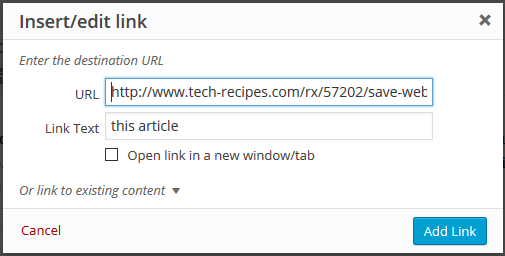 4.To Remove a link, click on it, and select the Remove Link icon from the WordPress toolbar. This leaves the link text intact, but turns it into normal text. Alternatively, you can simply delete the link text. This will remove the tie to the linked URL. 5.If you are adding in a link after you have written your whole article, you can highlight some words that you want to use as link text before clicking the Insert Link button. This will create the link over text you have already written.